Jackie Chan takes on evil biker thugs in Cannonball Run. The Skinny: Enjoyable early eighties fluff featuring a young Jackie Chan. Faithful LoveHKFilm.com readers may be scratching their heads at the inclusion of Cannonball Run, the 1981 screwball comedy starring Burt Reynolds at the height of his popularity, and featuring an all-star cast of clowns as they race across America. From Roger Moore poking fun at his 007 persona to the madcap antics of reunited Rat Packers Dean Martin and Sammy Davis Jr., Cannonball Run is an awfully silly, but admittedly fun ride. Now if all that sounds entirely irrelevant to a website dedicated to Hong Kong cinema, well, here's the justification: it features an early American film appearance by martial arts megastar Jackie Chan. But it's not exactly a plum role for Chan or an accurate portrayal of Asians either. Though both Jackie and Michael Hui (brother of Swordsman's Sam Hui) are clearly speaking Cantonese, their characters are erroneously identified as Japanese Subaru drivers. The fight choreography in the flick isn't that special either as poor ol' Jackie has to make do with an American stunt crew unfamiliar with the finer points of Hong Kong action. 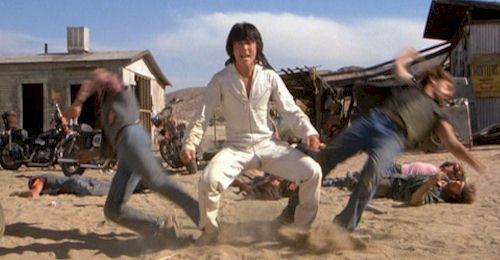 While it's no Police Story or Drunken Master stunt-wise, at least Jackie gets to kick Peter Fonda in the head. That's got to be worth something.